Hi everyone, today I'm back for Craftie Café and today I have a Father’s Day card to share with you all. I’m going to be using non-traditional Father’s Day products to create this card today, since the sentiments in this set are so fitting. I’m using the Taylored Expressions “My Super Hero” set along with the Pinhole Star Stacklets and Downtown Border dies. 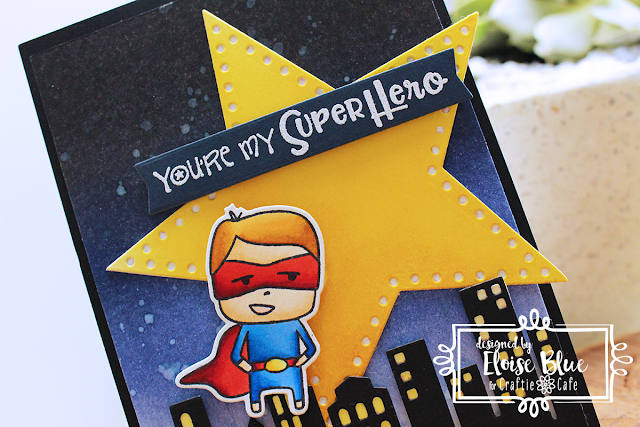 To begin my card today I first started off with stamping, colouring and die cutting my the boy super hero, from the My Super Hero stamp set. I’m using Copic Markers today and only colouring one image, so it’s super fast. Once my image was ready I worked on my other elements for my card. I first used the Downtown Border with some black cardstock and die cut that out, then took a piece of watercolour cardstock and Mustard Seed Distress Ink and ink blended the colour onto the side of the piece. I then used the Downtown Border Underlay die and die cut that out of the yellow piece. Now when you layer the two together, you get the yellow background peeking through all the holes in the windows. Next up I used the same cardstock and yellow Distress Ink and ink blended on the piece once again and then die cut the largest star from the Pinhole Star Stacklets dies out of it. I pulled out some Black Soot, Chipped Sapphire and Blueprint Sketch Distress Ink out and ink blended a full background onto another piece of watercolour cardstock, I flicked on some white spray mist when I was done and heat set it with my heat tool. I then added foam tape onto the back of my Downtown Border piece and adhered it to the bottom of my background. I then used flat adhesive and adhered down my star also. I then added foam tape behind the super hero, and adhered him down over my star. 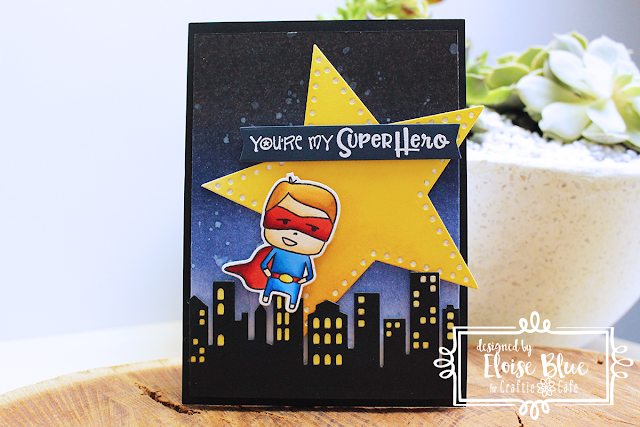 For my sentiment, I took a piece of navy cardstock and white heat embossed the ‘You’re My Super Hero’ sentiment on there. I then used the Blueprint 27 Dies from My Favorite Things and cut down my piece into a banner. I adhered it onto my card with more foam tape. To finish up I adhered my entire piece onto a piece of black cardstock and then onto a white card base. Thanks so much for stopping by today and I hope you were inspired.